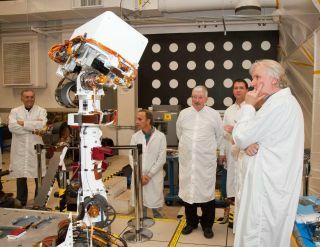 Academy Award-winning director James Cameron (right) inspects engineering model of camera mast for NASA’s Curiosity Mars rover. Cameron is a member of the camera team for the Red Planet mission. A 3-D zoom camera system developed for NASA's next Mars rover with the help of filmmaker James Cameron has been shelved due to a lack of time to get it ready for the mission's November launch. The camera builder, Malin Space Science Systems of San Diego, Calif., was hoping to use the 3-D imaging system to replace the main fixed focal-length camera on NASA's new Mars Science Laboratory rover Curiosity. That 3-D video capability on Mars was backed by Cameron, director of the 2009 box office smash "Avatar" and other films. Cameron also serves as a public engagement co-investigator for Curiosity, now being prepared for its voyage to the Red Planet. NASA ordered the Malin-Cameron project to stand down after it became clear that the camera could not be installed on Curiosity in time to meet the mission's Nov. 25 launch date. The mega-rover is now undergoing final checks at NASA's Jet Propulsion Laboratory (JPL) in Pasadena, California for delivery to its launch site in Florida. While development of the new zoom lens hardware was in the final stages, "insufficient time remained to complete the units and integrate them with the rover in time for its scheduled launch in November 2011," Malin officials said in statement released Friday (March 25). Malin Space Science Systems will continue to pursue the development of these zoom systems, both to prove out the design and to make the hardware available for possible use on future missions, the company said. Cameron said he is confident the technology will find a home on a future space probe. "While Curiosity won't benefit from the 3-D motion imaging that the zooms enable, I'm certain that this technology will play an important role in future missions," Cameron said in the Malin statement. The image shows Curiosity on a tilt table in the Spacecraft Assembly Facility at NASA's Jet Propulsion Laboratory, Pasadena, California. Malin officials said that the company, along with space technology firm MacDonald Dettweiler and Associates, had worked long hours in an effort to complete the systems in time, but encountered a number of technical problems. "While such problems are typical with spaceflight hardware, in aerospace parlance the zoom schedule was 'success-oriented,' and allowed for few deviations," Malin officials explained. "Although we are very disappointed that the zoom cameras will not fly, we expect the fixed focal length cameras to achieve all of the primary science objectives of the Mastcam investigation," said Michael Malin the camera's principal investigator and chief of Malin Space Science Systems. "At the end of the day there just wasn't enough time to disassemble the units, make the changes, put them back together, and get the instruments to JPL in time," said Mike Ravine, the Mastcam project manager at MSSS. A saddened Ravine recounted to SPACE.com the history of the on, then off, then on again status of the zoom lens system. "I've been thinking about the initial zoom descope in 2007. I remember describing to someone what a disappointment it was to have the zooms cut from the mission," Ravine said in an interview. "They were very sympathetic right up to the point that it came out that we were still going to get to fly four cameras on this big rover to Mars, and the sympathy just evaporated. I know how lucky we are. Sometimes, it's a bit more challenging to connect with that knowledge on an emotional level." The zoom Mastcams on Mars Science Laboratory would have provided improved operational flexibility, much better stereo imaging, and a 3D motion imaging capability that would bring the public along on Mars exploration, Ravine explained. "All of the capabilities would be of benefit on future surface missions, be they to Mars, the moon or some asteroid," Ravine said. "We want to finish these cameras for some future use, and we're pursuing potential sources of funding to do that."